Classroomtools.com - Are You Next? One of those easy to access handguns could end up pointed at you. The author wants to reinforce the beliefs of those who already fear the consequences of easy access to handguns. S/he wants these people to continue voting for and contributing to those who promise to seek and enact sensible laws to limit handgun purchases to those without criminal backgrounds or mental health problems. 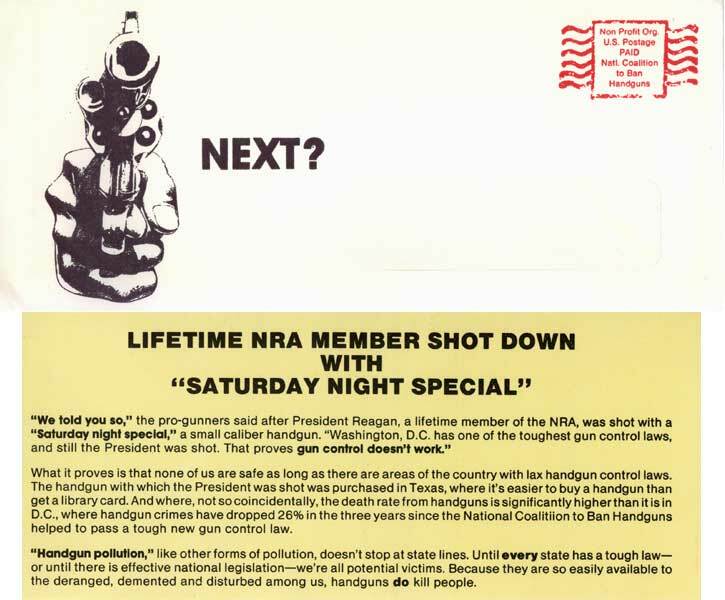 The gun pointing directly at the reader from the front of the envelope is designed to startle a person as s/he imagines what it must be like to have the barrel of a real handgun pointed inches away from her/his face. The text points out that even somebody as well protected as the President of the United States is not safe from a mentally ill person with the ability to buy a gun with no questions asked. It implies that a national law making such a purchase more difficult would have been more effective in safeguarding him than all the arms carried by the President's security detail. It ignores the point made repeatedly by pro-gun advocates that if such a man could not purchase a weapon, he would probably be able to secure it easily illegally - via the black market or a burglary. Organizations circulating pieces like this are very successful lobbies, whose work led to the enactment of the Brady law in 1993 in the face of relentless opposition from pro-gun groups.